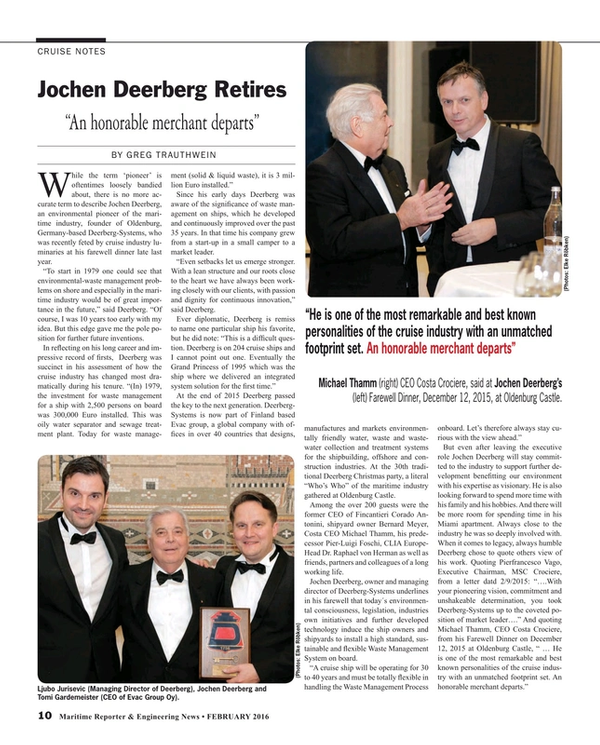 While the term ‘pioneer’ is oftentimes loosely bandied about, there is no more accurate term to describe Jochen Deerberg, an environmental pioneer of the maritime industry, founder of Oldenburg, Germany-based Deerberg-Systems, who was recently feted by cruise industry luminaries at his farewell dinner late last year. “To start in 1979 one could see that environmental-waste management problems on shore and especially in the maritime industry would be of great importance in the future,” said Deerberg. “Of course, I was 10 years too early with my idea. But this edge gave me the pole position for further future inventions. Since his early days Deerberg was aware of the significance of waste management on ships, which he developed and continuously improved over the past 35 years. In that time his company grew from a start-up in a small camper to a market leader. “Even setbacks let us emerge stronger. With a lean structure and our roots close to the heart we have always been working closely with our clients, with passion and dignity for continuous innovation,” said Deerberg. At the end of 2015 Deerberg passed the key to the next generation. Deerberg-Systems is now part of Finland based Evac group, a global company with offices in over 40 countries that designs, manufactures and markets environmentally friendly water, waste and wastewater collection and treatment systems for the shipbuilding, offshore and construction industries. At the 30th traditional Deerberg Christmas party, a literal “Who’s Who” of the maritime industry gathered at Oldenburg Castle. Among the over 200 guests were the former CEO of Fincantieri Corado Antonini, shipyard owner Bernard Meyer, Costa CEO Michael Thamm, his predecessor Pier-Luigi Foschi, CLIA Europe-Head Dr. Raphael von Herman as well as friends, partners and colleagues of a long working life. Jochen Deerberg, owner and managing director of Deerberg-Systems underlines in his farewell that today´s environmental consciousness, legislation, industries own initiatives and further developed technology induce the ship owners and shipyards to install a high standard, sustainable and flexible Waste Management System on board.